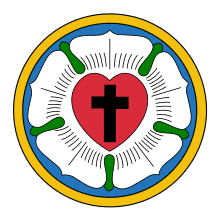 "This one and firm rock, which we call the doctrine of justification," insisted Luther, "is the chief article of the whole Christian doctrine, which comprehends the understanding of all godliness." Lutherans tend to follow Luther in this matter. For the Lutheran tradition, the doctrine of salvation by grace alone through faith alone for Christ's sake alone is the material principle upon which all other teachings rest. Luther came to understand justification as being entirely the work of God. Against the teaching of his day that the believers are made righteous through the infusion of Gods grace into the soul, Luther asserted that Christians receive that righteousness entirely from outside themselves; that righteousness not only comes from Christ, it actually is the righteousness of Christ, and remains outside of us but is merely imputed to us (rather than infused into us) through faith. "That is why faith alone makes someone just and fulfills the law," said Luther. "Faith is that which brings the Holy Spirit through the merits of Christ". Thus faith, for Luther, is a gift from God, and ". . .a living, bold trust in God's grace, so certain of God's favor that it would risk death a thousand times trusting in it." This faith grasps Christ's righteousness and appropriates it for itself in the believer's heart. Finnish scholarship in recent years has presented a distinctive view of Luther. Tuomo Mannermaa at the University of Helsinki led the "The New Finnish Interpretation of Luther" that presents Luther's views on salvation in terms much closer to the Eastern Orthodox doctrine of theosis rather than established interpretations of German Luther scholarship. ↑ Herbert Bouman, "The Doctrine of Justification in the Lutheran Confessions," Concordia Theological Monthly 26 (November 1955) No. 11:801. ↑ Herbert J. A. Bouman, "The Doctrine of Justification," 801-802. ↑ Markus Wriedt, "Luther's Theology," in The Cambridge Companion to Luther (New York: Cambridge University Press, 2003), 88-94. ↑ Lewis W. Spitz, The Renaissance and Reformation Movements , Revised Ed. (St. Louis: Concordia Publishing House, 1987), 332. 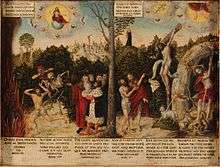 ↑ Martin Luther, The Smalcald Articles in Concordia: The Lutheran Confessions (Saint Louis: Concordia Publishing House, 2005), 289, Part two, Article 1. ↑ Preus, Robert D. "Luther and the Doctrine of Justification" Concordia Theological Quarterly 48 (1984) no. 1:11-12. ↑ See Carl E. Braaten and Robert W. Jenson, eds. Union with Christ: The New Finnish Interpretation of Luther (1998); also Ted Dorman, Review of "Union With Christ: The New Finnish Interpretation of Luther". First Things, 1999. Retrieved 2007-05-31. ↑ William Wallace Schumacher, "'Who Do I Say That You Are?' Anthropology and the Theology of Theosis in the Finnish School of Tuomo Mannermaa" (Ph.D. diss., Concordia Seminary, St. Louis, Missouri, 2003), 260ff.